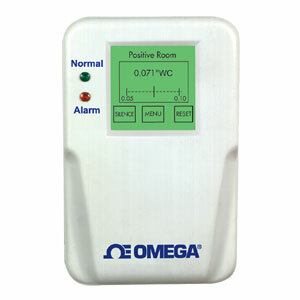 OMEGA’s DPG300 room pressure monitor is designed for critical low differential pressure applications that require stringent pressure monitoring and alarming. Optional BACnet network capability for integration in building automation control systems is available. DPG300 can monitor positive or negative air pressure in protected environments. It comes as a complete system that includes a convenient backlit RGB LCD display with an intuitive graphic user interface for pressure, security, calibration and alarm set up. The touch-screen allows finger-tip access to menus that guild the user through setup. Visual red and green LEDs and local audible alarm, with a time delay feature to prevent nuisance alarms, alert personnel to system status. DPG300 also has a SPDT relay output for remote indication of system status.